Tonight I'm sharing some beautiful surprises with you. First is an awesome heart bead by Payton Jett. When I saw the photos I just had to have this bead. I turned Payton onto Diane Setterfield's book, The Thirteenth Tale, and after reading about fire and cool grass, Payton was inspired to put that into glass...and Destiny was born. as a sign of an special connection to this story and to each other. 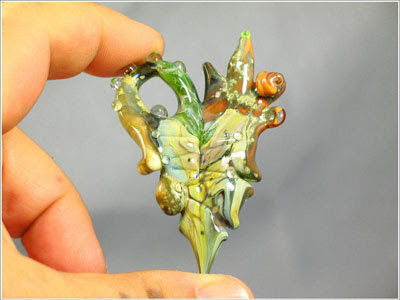 The second photo reflects my discovery of glass painted porcelain bead work by Joan Miller. Click on her name to be linked to her website and just be in awe of the incredible finite detail she pours into her work. I've not seen anything like it. Some of you might know her work as the heads and bodies for Penny Michelle's silver art pieces. I have to learn more about this process so if you have info to share, books to suggest, tutorials to show me, please do! 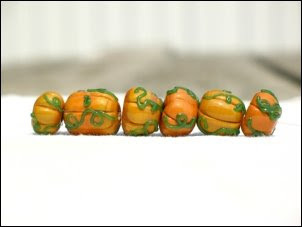 Next are spectacular custom lotus beads I requested from Aimee Milan at PolyChromeBeads. The silver plum she used for the glass flower caps is my favorite. And the layers you see here? Beautiful, yes, but to see the true depth of them in person is simply jaw dropping. 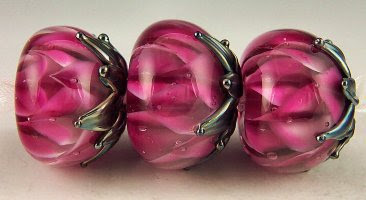 These beads are big and fat and luscious. 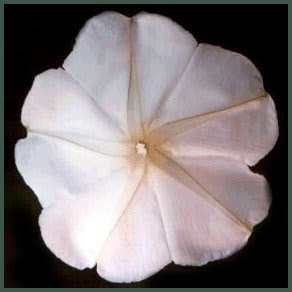 Lastly, my spirit friend has been telling me of her moonflower which blooms under moonlight...well, they can bloom from late afternoon to morning, but HERS bloom under moonlight which is so much more romantic! I didn't have one of her photos, but Amy J. Clark Haden was kind enough to allow me to use hers. These flowers are the size of your open hand! Like a morning glory, they grow on vines. You can read more at Amy's site by clicking her name. I'd love to hear any comments you have on the topics I've hoped to have entertained you with tonight. The more the merrier! The white punks to the left by Payton Jett are the basis of my custom request for all cream ones that are on their way to me. 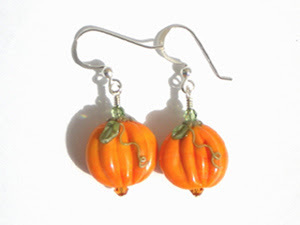 Just envision these already pretty punkins, but completely in cream...vines, stem, everything. I expect them to look quite sophisticated. Black and white birds are in the same box and I can hardly wait to hold them! 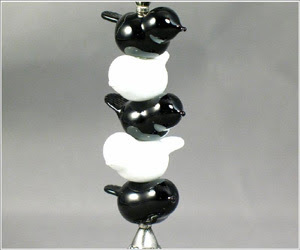 I have several in exotic glass color mixes, but these are purely black birds and totally white birds. I'm thinking....ribbon would work with these. kind enough to award me the Brillante Weblog award, which I must honor by passing on to my favorite blogs. 1. Of course, being a faithful cupcake lover, I have to keep in touch with the daily entries of Cupcakes Take the Cake blog. Allison, Nichelle and Rachel scour the cupcake world in every category possible to keep us all aware of worldwide cupcake events and new products related in any form or fashion to real, edible cuppies. pull me out of my everyday world and into a whimsical one that just relaxes me and brings a smile. 3. The Cookie Sheet. More drawings from Donna Childree Gotlib aka CookieSunshine on Etsy. Donna's art feels very free to me and light and sweet. Some are in pencil, others in color and are accompanied by lovely original poems. 4. Building A Bakery from Kari Haskell of the Retro Bakery cupcake shop in Las Vegas. Kari's sassy wit and her USE of capital LETters for emphasis in entries regarding the constant juggle of family and business life just crack me up, keep me laughing and keep me coming back for more! 5. My Lily Eden. Sweet photos of the lovely little Lily often grace these pages leading to LemonTreeStudio paper goodies on Etsy and has a weekly Friday freebie! This is a great place for featuring loads of fellow artists so it's not only fun reading but shopping as well. 6. The above led me to On The Dot Creations an Etsy seller of computer wallpaper designs whose blog has daily displays of all kinds of finds from Etsy (mostly), has contests quite often along with brain puzzlers that are fun challenges and just about anything you can think of that has dots! 7. All Things Cupcake has near daily cupcake related finds. She really digs deep to find the good stuff! Thanks to all of you for the news and entertainment and thanks again to you, Marianna. 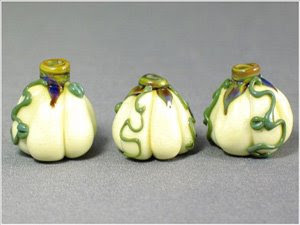 Punkies are in season...that's what I call lampwork glass pumpkins. These earrings are up for sale at RockerJewlz on Etsy and feature Lezlie Belanger's torch work. The punkie set below is from Payton Jett that I'm working with right now. Check back to see what they become. The update from "My 1ooth post" on August 19th is that the bird jewelry mentioned is awaiting one final piece...a custom glass toggle clasp! I love how the necklace turned out...it has 3 glass birds in it and no silver so it just ripped my heart to add a sterling clasp. I used only stones and glass in the makeup so in a flash of brilliance from an artist, I am going to try a handmade glass toggle clasp that is soon on its way to me. I'll be sure to update you when I receive it and place it on its new home. Visited Target store yesterday and the end caps feature pink goodies for breast cancer awareness. Whomever is heading marketing for this campaign has really stepped it up the past couple of years. I mean, when Dyson announced a pink vacuum cleaner, I thought how could anyone top THAT??? I need to replace my Brita water pitcher. 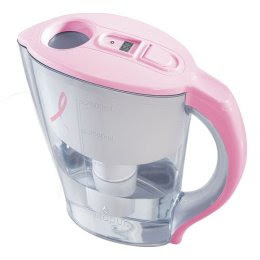 Brita and Vitapur each have pink ones...wow, that would be wild, but I highly doubt it's appropriate in a household with me and 2 men! 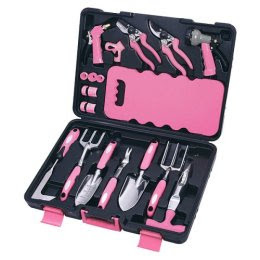 So I might have to steer towards the pink garden tool set as I KNOW they won't be using them OR doing the gardening. Ha ha. Oh, I didn't say "Chihuly" yet today, so there you go. Gotta get those bloggers here, you know. I'm getting bolder in ordering larger quantities of bead and component supplies. I just got a big batch of Bali sterling toggle clasps for all the cupcake beads that are being made for me so it feels good to trust that it's not just a big bill facing me, but greater sales. So with that, I invite you to visit me at www.RockerJewlz.com and www.RockerJewlz.Etsy.com for your jewelry viewing pleasure. When next you return, my goal is to talk about Paris and Stoned Birds...did I get your attention?